From the oldest times humans are considered to be the most artful and sly creatures, who don't want to conform to honesty every time. The temptation to get something not paying anything for that is very insidious and can seize even the fairest person that can't find the refuge from such a shameful feeling. But in spite of this differentiation between different mental outlooks, everybody would like to wake up a millionaire without forcing too much or better to say too long. It's clear, that one wish isn't enough to complete the most genius plan ever that is generating in your mind. The real cheater has to be clever, smart, skillful and moreover he has to be the master of the gambling sphere. The gaming experience must be in the highest level. It's good, that such persons can find the friend in the casino who is the roulette dealer by chance, or the operator who is making the wheels. But even if you don't have such benefits that can play great role in the cheating operation, your own mind and agile hands can do much, better to say everything. Yeah, don't forget to take several of your insatiable friends who are fearless and clever enough to help you to put money to work and play roulette. Laser scam: nobody will forget about the occasion in Britain at the Ritz Casino, where the group of cheaters could grab the greatest amount of roulette winnings during two days and then convince the police that they hadn't done anything illegal and run away with full bags of money and happiness. They just used the laser that was linked to a computer which could predict somehow the random winning combinations. They calculated in the speediest way the outcome and received their money. Ball tripping: the cheaters drill the ball in the ball's upper track where they locate the small spring pin that is acting as soon as the game starts with the strategy that it will supplant quickly in the upper track. It happens in front of the dealer who also participates and helps even with the time calculating. Past posting: this is the most used cheating method when invisibly the most adroit players exchange the loosing chips to the winning numbers or put more chips to the successful number. All this happens during the split second, during which the dealer is waited to be distracted by one of the band's player. Even the movements have to be predicted in this kind of cheating. 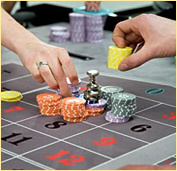 Moreover there are several of subtypes: the roulette slide, the roulette mix-up, the roulette section. Top hatting:this is a situation during which the gamblers have arrangements with dealers that have the scam and replace the chips into the winning squares. The sharpness here is the most needed trait, because all the attention is directed to the dealer that has to convert himself into the illusionist. Mechanical rigging: in this case the cheaters work with the roulette wheels. The gamblers can put the magnets onto the ball and table or just to make the padding fraud with the wheel material from which depend the ball speed and spin. 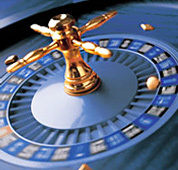 Even don't think now about these methods as the treason information that you can realize during the roulette playing. It's impossible and even the attempts are punished. So, choose the answer "not to be" in the cheating gambling company and luck will come to you for sure!